I have some g-flex coming today but it is the 655 pre thickened stuff http://www.westsystem.com/ss/g-flex-epoxy/. Do you think that would work the same? It would be a 60 mile round trip IF I could find some 650 in the cities. I think it would work OK for you. I'd probably put it on, assemble with the rivets (but not buck them), monitor the 'tack' (on a separate piece of material, and then buck them (not all the way tight) when you can feel it setting up and firming. Then I'd buck them tight once the epoxy cured. I'd then also put a bead around the perimeter and maybe would warm the metal beforehand (NEVER warm an epoxy mix, is will cause it to cure prematurely!) with a heat gun on warm, not hot. If covered by the floor, you're OK, else top-coat any epoxy patch. On those I did on the bottom of the hull I just used the special-for-aluminum ablative antifouling paint, but you could use anything. UV damages epoxy products. Reading the instructions on the G flex 655 I got it looks like I will have to sand down to bare aluminum clean with acetone, vinegar wash and then prime with self etching primer. Basically I to get rid of the top coats of paint I put on for the 5200. One ques tho. My understanding ( I've never riveted before) of riveting is that you put sealer around the base of the shaft to seal the head when bucking. If I only buck the rivet "snug", then wait for the Gflex to fully cure before bucking the rivets tight wouldn't that break the seal? How long does the Gflex take to cure? The 3M5200 slow cure can take a week. Got the patch(s) put on. I went with the 5200 between patches and hull on both inner and outer patches. My SIL had about 1-1/2 hrs to help last Saturday so I figured the 5200 would be quicker. I had searched the site for rivet spacing but didn't come up with anything. So I probably put in to many rivets. Is there any guide lines for spacing? Won't do me any good but may help someone else. 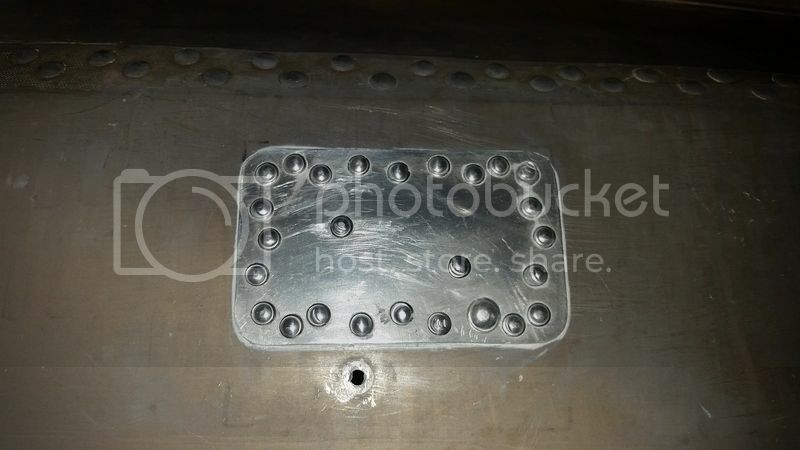 Also can some one tell me why the circles around the base of the rivet heads) they are 1/8" brazier head rivets and I used a 1/8" brazier head set to install them. I know what caused the half moons on the heads. It was my first rivet job. Last edited by oldude on 15 Sep 2016, 11:50, edited 1 time in total. I'd be interested in rivet spacing too. Aircraft Spurce website has some engr notes/guidance IIRC on shear strength and rivet spacing, but I personally copy/model/use what the original hull maker used for their rivet spacing for my repair work. Don't re-invent the wheel ... just COPY it! Dale that's what I was thinking. Right above my patch is where the side piece of the hull is riveted to the bottom of the hull and they are spaced close together and staggered. After I got the holes drilled thru the patch and hull I got to thinking these are more rivets than necessary. +1 and you have learned a new skill. If you're using the proper size and style of rivet tool for those rivets and still getting those circles around the base of them, I'd guess your air pressure is set too high. Might be high enough for the heads of the rivets to smash down and deform outwards, if that makes sense. Then your subsequent hits with the air gun puts the little circle in them. FWIW, when I set my air gun for rivets I'll take it to a piece of non pressure treated 2x4. I'm looking for the tool to just make an indention in the wood. If it smashes through the wood the pressure is too high, if it doesn't dent the wood, the pressure is too low. My compressor is old and the gauge isn't very accurate. So I do this every time I start a rivet job on my boat.